On a routine Sunday morning shift as a Courtesy Boat Inspector, Brian Cushing found a piece of variable-leaf milfoil hanging from a boat trailer preparing to launch into Moose Pond. Variable-leaf milfoil, or Myriophyllum heterophyllum, is an invasive plant that has been found growing in eighteen southern Maine lakes, but not Moose Pond. The motor boat, which on quick inspection looked clean, had last been in Sebago Lake, Cushing recalled. Knowing that invasive milfoil grows in parts of Sebago, that raised a red ﬂag for him to inspect the boat and trailer extra carefully. “It was clean except for that one dried plant, which looked suspicious. I bagged it and took it to Peter Lowell at LEA. It was rehydrated and it was milfoil,” Cushing said. “Most of the milfoil found during boat inspections is generally from someone who has been in the Sebago Lake corridor,” Lowell said. “The Lower Songo River is the Typhoid Mary of the whole area.” “Boat inspecting is like being a lifeguard,” Cushing said, “You have to always be vigilant, for the rare time a swimmer might be in trouble, or in this case, a boat is carrying invasive plants. Even a small fragment of a hitchhiking invasive plant can harm a lake; it can rehydrate, root and spread into a full-blown infestation.” “Part of the whole deal is educating people to inspect their own boats,” Cushing said. “I worry about the times we’re not here or people put in late, when there is no inspector. It underlines the importance of educating the public so it is automatic that they inspect their boats for plants.” Most boaters were friendly, expressed thanks for his work and some wanted to learn more about invasive plants, Cushing said. For several years now, the Moose Pond Association has helped fund boat inspectors at both the Route 302 launch in Bridgton and the Denmark launch from late May through late September. Courtesy boat inspectors are hired, trained and scheduled by the LEA. 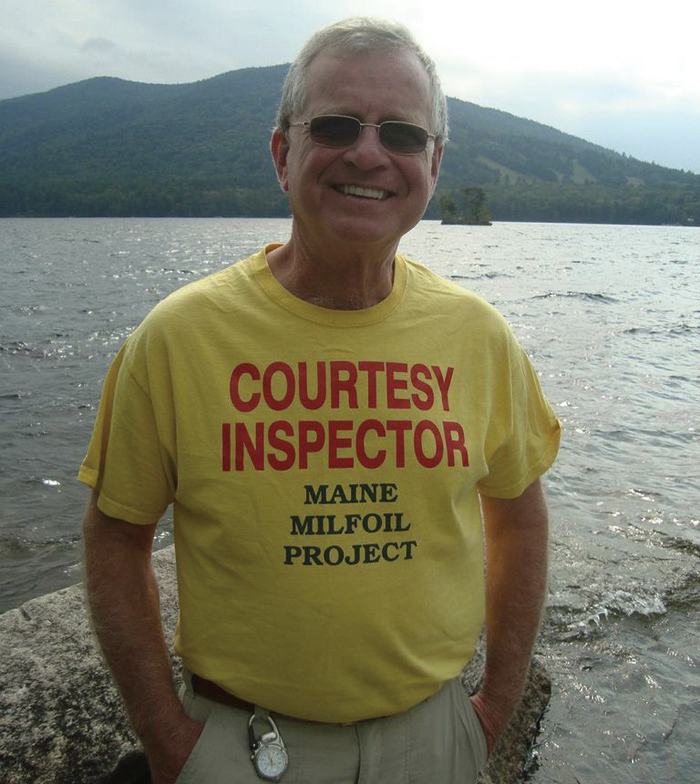 Cushing, of Bridgton, works part-time as an inspector, mostly on the weekends. This fall he returns to the University of Maine at Farmington to teach geography. It was Colin Patterson’s ﬁrst year inspecting boats. “I really think it is a good job,” said the Sanford High School student. “You get to do stuff for the lake, which means a lot when you live on the lake. You hear a lot about other lakes that are infested, and it is just awful.” Besides looking at the boats, the inspectors also encouraged boaters to check their entire boat, propeller, ﬁshing gear and trailer for plants and to use the boat wash stations at the West Bridgton. Fire Station, just east of the Route 302 launch, and another one south of the Denmark launch across from the public beach. The MPA maintains these boat wash stations, with the help of Collins Plumbing of Bridgton. This year, there were a total of 1,098 paid CBI hours and 104 volunteer hours, for which the Moose Pond Association contributed $11,676. A grant of $1,500 from the Maine Department of Environmental Protection also helped fund the 1,978 boat inspections that were done this past summer. The grant is funded by the cost of the milfoil stickers. The total cost of the inspectors, wash stations and miscellaneous costs was $16,495. With this investment of resources, Moose Pond had inspectors stationed at the two launches 10 hours each day during the summer, which was more time than most lakes in the area. From these inspections, 85 plant fragments were found, one of which was conﬁrmed to be invasive milfoil.